It's a full house in the Basement tonight! We've got the WHOLE CREW with us, as Pete and Ramon hit the roundtable with Greg, Cheezeburger, Craddock, and Red! The boys talk the Avengers Endgame leak, as well as three awesome trailers: Child's Play, Swamp Thing, and The Boys. And of course, the first episode of the final season of Game of Thrones! This, plus two full weeks worth of comics as only your favorite podcast buddies can offer! Grab your shots and hit play! It's finally here! Pete's STD results! -- No -- The Mount Carmel Feast! Oh, and the guys talk about good deals, bad drawings, and non-events. OH WHAT A WEEK. I am referring to the Dark Knight movie. This weeks books are ok at best. A few gems in the pile of books though. Spoilers to come. AT THE COMIC BOOK MOVIES: "CITIZENS FOR BATMAN INVADE N.Y.C"
Real Pete! Real Steve! Real Adam! This week the boys return to form, reviewing the funny books we all love. Adam reviews some of Northern Ohio's comic book stores, Steve eats a former host, and Pete laments the end of one of his favorite books. All this, and the mystery of...MINI-FISH. It was truly a good damn week. Spoilers to come. •Echo 4 – I still like this book. It comes out more frequently then Rasl and so I like the growth of the characters and plot. The power of the weird armor is finally being shown more and the influence of the military is in play too. too many damn books for key words! 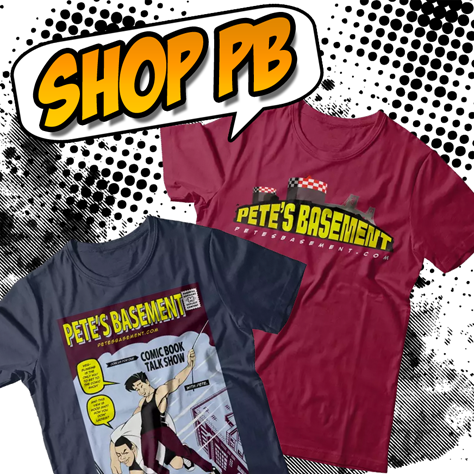 Something's not right with the basement crew, and Pete suspects everyone. This week, his suspicions are confirmed.